Is the deal done? Yes, it has been signed off by the UK Government and will be signed off by the EU27 this Sunday. It will then need to clear the UK Parliament who, like the EU Parliament, has the power to vote the deal down. Renegotiation – The most likely outcome, if the EU is willing, the cost of which may be an extension to the exit date, which could mean an awkward U-turn for May. No Deal – Unlikely at this stage given the lack of Parliamentary support. Second Referendum – May has said there will be “no second referendum whilst she is leader”. Labour has said it will support a referendum if May refuses to hold a general election if the deal is voted down. This could lead to a face-off between the Government, opposition and Conservative MPs if all other options for renegotiation and repeat votes are exhausted. Will there be a general election? This is highly unlikely. The Fixed Term Parliaments Act 2011 requires over two thirds of MPs to support an early general election, or, following a motion of no-confidence, for the new government to fail a confidence vote within 14 days of one being held – both of which are unlikely given Conservative MPs reluctance to risk a Labour government. Will Spain ‘veto Brexit’ as claimed? No. Brexit cannot be ‘vetoed’ i.e. stopped. The UK’s decision to invoke Article 50 means it is projected to leave ‘with or without a deal’. The agreed UK-EU deal on the other hand can, but only if a ‘super-qualified majority’ of EU states do not vote for the deal, meaning less than 20 of the remaining 27 support it on Sunday. This is unlikely to happen on current projections. Spain can however veto a future UK-EU trade agreement, to be negotiated after the UK’s departure. A deal was announced this week, with both the Withdrawal Agreement and Political Declaration completed and signed off by negotiators and the UK Government. The next step is for EU27 leaders to sign it off this Sunday, before it is taken to the UK and EU Parliaments who will decide whether to approve the deal. 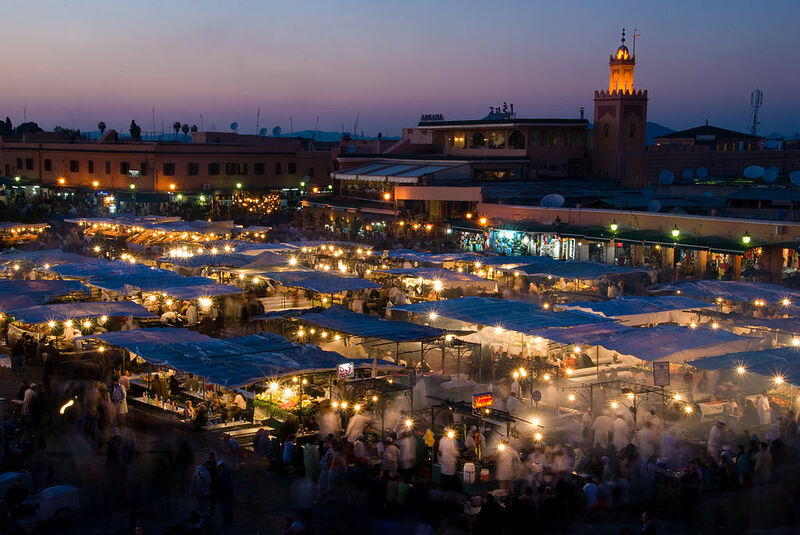 Both sides have stressed concern over the deal’s contents, but a general belief that reopening negotiations would cause both sides to demand additional concessions has thus far allowed the deal to remain in state. This is likely to change if Parliament’s ‘meaningful vote’, expected on the 11th or 12th December, results in a rejection of the deal as it stands. As a first port of call, renegotiation is likely to be reconsidered by both sides, and if denied, is likely to lead to further calls by Labour for the Government to step aside to allow it to have a go at extracting further concessions, along with Brexiteers who are demanding fresh leadership to drive for a better deal. If, however, the deal passes given MPs concern over the potential consequences, which May believes amount to ‘No-deal or possibly no Brexit at all’, then the deal is likely to be turned into legislation in January before the UK’s departure in March. The likelihood of this happening is likely to become clearer following Sunday’s EU Council meeting and the ensuing government campaign to convince MPs to back the deal. The Times has reported that plans are under way by Cabinet Ministers for a second vote on the Brexit deal if the first fails. To date 84 Conservative MPs have publicly declared they will not vote for the deal, making the likelihood of the first vote passing highly unlikely. It is yet unclear how a second vote would be reframed, its chances of success, and the repercussions of a second failed vote. Despite expectations that the core Brexiteer group on the edge of the Conservative Party had the numbers to bring down Theresa May’s leadership if pushed too far on her deal, the truth did out this week when the coup fell flat. Concern over the repercussions of an internal vote of confidence in the Prime Minister is said to be one of the core things that stopped letters being submitted, alongside a strongly held belief that she would win any vote ‘comfortably’ given the lack of a natural successor that could command the (tentative) support of both wings of the party. Whilst the drive for letter submissions has died down in recent days, it could pick up closer to the meaningful vote if the deal is voted down, with a change in leadership one option to drive change to get a deal over the line. Leaked minutes from the last Cabinet meeting to endorse the Withdrawal Agreement has shown deep concern by many previous and existing cabinet ministers over the agreed deal for the UK’s departure. The most damning is Jeremy Hunt who told the Prime Minister he believed the deal amounted to a ‘Turkey trap’, referencing the perceived limbo Turkey endures as it seeks accession to the EU, whilst enforcing the EU’s customs regime on most of its goods. Both Sajid Javid and Liam Fox warned that it could lead to the UK being unable to strike free trade deals with third states, given uncertainty over the end-state and end-date of a UK-EU free trade agreement that would supersede customs union membership as the default relationship when the transition deal ends. Many ministers opposed to the deal remain in Cabinet, with five (Gove, Mordaunt, Grayling, Leadsom, Fox) seeking to push May for further concessions to ensure the deal passes Parliament. At present they appear unlikely to have been successful, but may play a pivotal role if the deal is voted down. Director General of the CBI, Carolyn Fairbairn, has said that investment is ‘flooding’ out of the UK as a result of Brexit, in turn welcoming the deal that has been done between the UK and EU to avert a no-deal Brexit. Fairbairn said that whilst the deal was not perfect, the transition period would help for a future agreement to be forged. She however did warn that ‘endless transition’ would not be beneficial for business who would find themselves in permanent limbo, further impacting confidence. The CBI also said that whilst there was ‘sympathy’ with those calling for a second referendum, the path would be murky and could ultimately lead to no Brexit deal at all, and thus could not support the campaign. Despite the official position of the CBI, a later leak after both the withdrawal agreement and political declaration text were published, showed the CBI’s Head of EU Negotiations was less pleased with the deal. Nicole Sykes said that there was “no need to give credit to the negotiators [of the agreement] I think, because it’s not a good deal”, a sentiment shared by many MPs who will decide on whether to progress the deal as it stands as early as next month. After Theresa May announced that she had ‘firmly rejected’ demands for access to UK fishing waters to be linked to a future trade deal within the political declaration, the EU’s deputy chief negotiator Sabine Weyland asserted that the UK needed mutual fishing access to retain access to the EU’s cod and haddock stocks, with an accompanying table showing UK imports of both. The table further showed that larger proportions of mackerel and herring were caught in UK waters. The issue is likely to flare up further after Brexit, with the EU hoping to link market access to fishing water access given reliance of EU fisherman on UK waters for a large proportion of their catches. Further concern is given to the relatively low WTO tariffs on the import of fish from other WTO states, meaning the UK could effectively take advantage of increased supply to catch, an exit from the Common Fisheries Policy (CFP) and access to the EU’s market, increasing market share for exports to EU27 states to the cost of Spain for example. Spain has given a clear indication that it will vote against the deal done between the UK and EU, given that the political declaration does not exclude Gibraltar from a future trade deal between the UK and the EU. As a British overseas territory, Gibraltar forms part of what May calls the ‘UK family’, whilst Spain argues that it should be considered a separate territory in any future trade deal. The vote against the deal, whilst not having the ability to veto the overall agreement, opens up potential additional areas of consideration if the deal is reopened for renegotiation. It also sets up a worrying precedent about a future UK-EU trade deal, where every member state has an effective veto over an EU wide trade deal, adding weight to Spain’s claims, which include shared sovereignty of the Rock. 18th December: Sources suggest this will be May’s date of a ‘meaningful vote’ in Parliament. January 2019: Possible start of debate on legislation to bring EU deal into UK law. 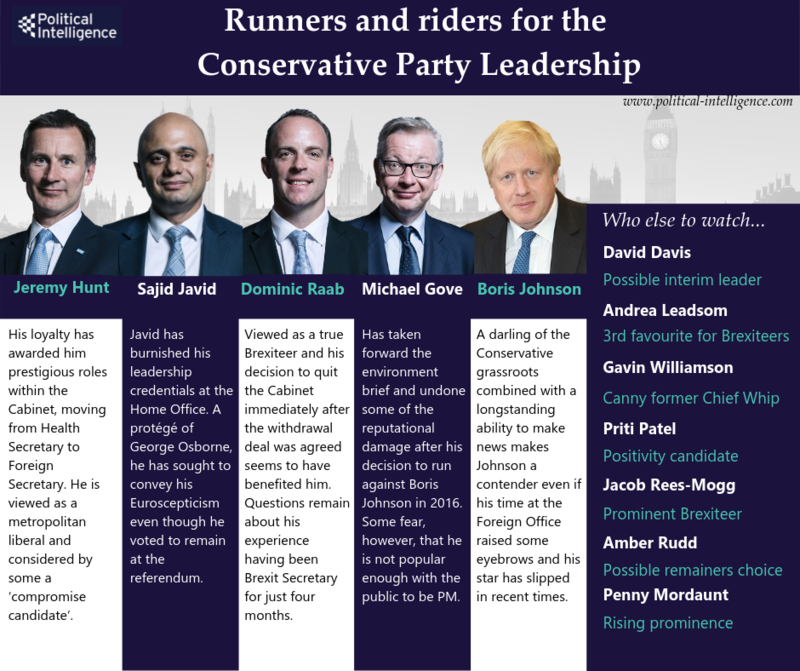 Here is a list of ‘runners and riders’ for the Conservative Party leadership if a leadership challenge is mounted in the coming weeks and months ahead.